In 7 Days in the Fire Mountain you take on the role of an unnamed woman who is follows a mysterious spirit who appears as a boy and encourages you to climb to the top of Fire Mountain. It’s a maze-like path to the summit, that will take several days to travel. Your health is slowly dropping continuously too so you need to need sustenance to keep you going. This comes in the form of you drinking blood from the corpses of dead animals and the occasional dead hiker. 7 Days in the Fire Mountain takes around 20 minutes to play through (if you survive) and the narrative is left largely up to the player to interpret from the few clues received throughout the journey. There are occult overtones and the presence of the Three Wise Monkey statues seems to indicate turning a blind eye to an evil deed. There are also themes of pregnancy, depression and sacrifice, all of which may help you draw your own conclusions about what’s really going on in the mountain. It’s a fascinating experience with an eerie occult vibe that really gets under your skin as you make your way up the mountain. The pixel art animation is excellent and the narrative is very intriguing. 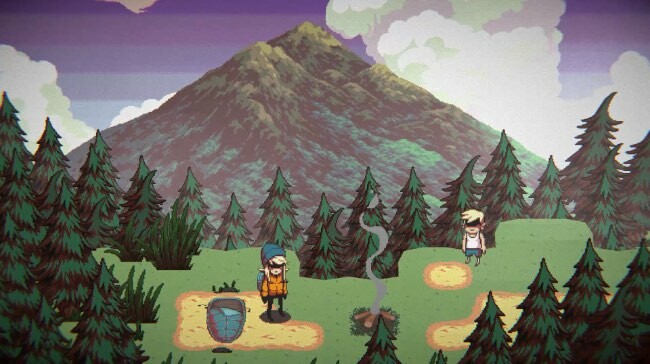 A strange and sinister little mountain adventure well worth scaling.